CADC T-SHIRTS are now available in these two brilliant designs, men's and women's cuts and sizes. The shirts are 100% pre-shrunk cotton, manufactured by a member of the Fair Labor Association and printed by Homeboy Industries in Los Angeles, an organization providing services and job training to former gang members. All shirts are $20 plus $7 shipping. 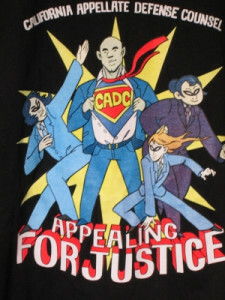 Send your check stating which design - Superheroes or Scales of Justice, men's or women's, and what size. In the Superheroes design all we have left are men's medium and large and women's small and large. In Scales of Justice, we have men's medium, large, and extra large and women's small, medium and large. You can pre-order other sizes, including children's sizes for our next batch. Send your check to CADC, 4470 West Sunset Blvd, Box 708, Los Angeles, CA. 90027. If you want to check on size availability before sending check, e-mail rcovin13@gmail.com. Credit card and PayPal payment options will be available when the new website launches - hopefully in April 2014. Rod Jones and Gordon Brownell developed and gave an ethics MCLE presentation they are happy to share! It's entitled, "(I Can't Get No) Satisfaction: Self-Exploring the Nature of Appointed Appellate Advocacy” It's about getting satisfaction from appellate work, maintaining a positive approach and energy in the face of one frustrating appeal after another, keeping our clients fully engaged in the face of overwhelming odds, and how to go to sleep at night with a feeling of professional job satisfaction. Rod and Gordon have graciously offered their materials to any chapter or member who would like them. CADC is now on Facebook. Please "like" us to receive news and updates. Please remember that the page, and any comments made on it, are public. CADC and Lexis have negotiated a 40 percent discount on three different plans for CADC members. For information about rates and plans, please call 800-227-4908 and say that you are a member of CADC. You will be given the contact information for your local representative. If you already know who your local sales rep is, you can contact him or her directly; be sure to say you are a member of CADC and want to take advantage of our group discount. This discount is not available to anyone who is currently in a contract with Lexis. Once your contract expires, you will be free to take advantage of the group rate. by John Likas, Greenpath Chief Communications Officer, GreenPath Software Solutions, LLC - creators of AttyXpress - the online web service for filing and submitting CA Appellate briefs. We have heard from folks who are using the cover letter methodology to include the reply brief as a part of the respondent brief package that is sent to the client and/or others under control of the submitting attorney. In this scenario, the submitting attorney would select the reply brief recipients individually by checking the ‘Cover Letter’ check box on the ‘Distribution List Maintenance’ page. Another lightly used feature is the ‘Upload/Merge Brief PDF Section Files’ located on the ‘Brief File Upload Page’. Herein, a client can upload and merge several smaller PDF’s, and can view the merged PDF document prior to submission. Clients have requested we add a miscellaneous payment page for those instances where additional brief related services are requested. We are targeting mid May for this implementation. Join the many Appellate Attorneys already using our service to make filing your briefs as easy as uploading a document and giving us your instructions. The briefbank now has 1431 briefs in it by 139 authors! If you haven't tried it out, please do. The Brief Bank Committee volunteers are on call 7 days a week from 8 am til midnight to help you! Visit the forums to ask for help or advice. If you are one of the many contributors - thank you! Keep up the good work! One of the benefits of becoming a CADC sustaining member is that this includes admission to CADC's annual seminar at no additional cost. 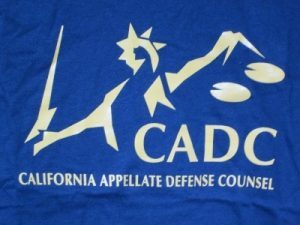 In order to make this benefit more flexible and useful, the CADC Board has voted to amend this benefit to provide that the annual CADC statewide seminar may be attended for free either by the CADC sustaining member or by another member designated by the sustaining CADC member to attend the seminar in his or her stead. ARE YOU TREATING CADC MESSAGES LIKE SPAM? We have learned that some CADC members have not been receiving our messages because their spam filters have blocked CADC e-mail announcements. Problems have come up as to some members who use popular Internet services such as AOL, PacBell, Adelphia and Verizon. Also, Gmail hides CADC e-mails in the Promotions folder. Look for the tab at the top of the screen from your inbox. CADC sends out notices from the following addresses: renewals@mail.cadc.net, webmaster@cadc.net, sachiwilson@sbcglobal.net, and rcovin13@gmail.com. Messages from these sources should be cherished and read. If you have not been receiving CADC messages from these sources please check and set your spam controls to unblock messages from these e-mail addresses. Members should remember that our Web site is the place to indicate changes to your e-mail address. To make changes to your contact information: Log in to the Member Area and click on My Profile. At that point you will be able to make any desired changes to your contact information. When you have finished, click Update to save your changes. In connection with Complete Equity Markets (CEM), CADC is offering its members a special deal on a custom-tailored malpractice insurance policy. This policy is relatively inexpensive and is geared toward CADC members who handle some privately-retained cases in addition to their court-appointed appeals. For a copy of the CADC malpractice insurance policy and an application, call Complete Equity Markets and ask CEM to mail you copies of these materials. Telephone: 1-800-323-6234. You can look over the policy and, if you want to obtain coverage, the application takes less than a hour to fill out. You will get a premium quote within a couple of weeks after submitting your application. The premium varies with the percentage of your income derived from non-project appointed cases. You can obtain this information – the policy application and a price quote – by going to the Complete Equity Markets Web site at www.cemins.com and clicking on the link to Public Defenders/Assigned Counsel Limited Practice Coverage. You can submit your application or send CEM an e-mail at that site, with any questions you may have. Monthly payments and financing for the payment of annual premiums is now available at very low rates. Contact Complete Equity Markets for more information. If you have any questions regarding this insurance policy contact CADC members Gordon Brownell at gsbrownell@aol.com or (707) 942-4565, or Dave Lampkin at dplampkin@aol.com or (805) 389-7769.